When someone buys $50 (or more) worth of Hearthstone cards, they inevitably do some simple math to figure out each card's rarity. 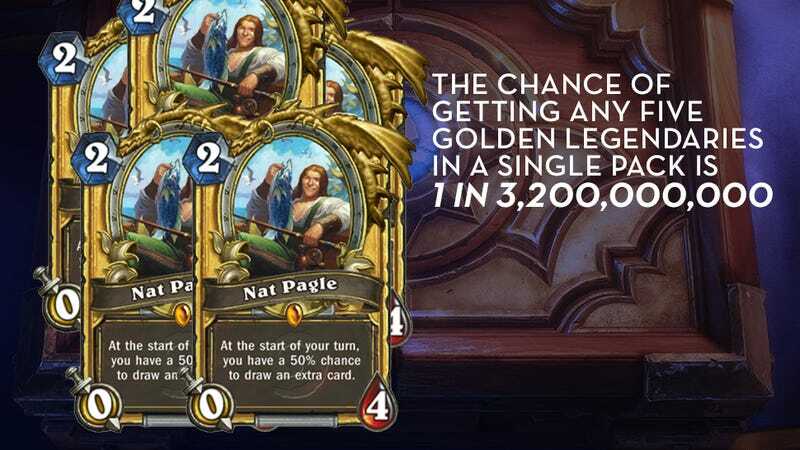 But those numbers aren't actually useful for figuring out your chances of getting a legendary or golden card next time. If you aren't familiar with Hearthstone, it's a collectible card game similar to Magic: The Gathering. To get more cards, you buy 'expert packs' with your in-game winnings, or with real money. You get random cards, with four levels of rarity — Common, Rare, Epic and Legendary. So these numbers are accurate in that they reflect what percentage of each rarity we got in the 200 cards we drew, but they're useless if I was trying to guess what future packs might hold and decide if it's worth spending real money on expert packs. Every time you open a pack in Hearthstone, you're getting five cards, so you need to find the probability that any of those five will be what you're looking for, and account for the guaranteed rare card. To find the data, I obviously couldn't buy 1,000 packs, even on Kotaku's budget. But luckily, most people who plunk down $50 (or more) on cards also tend to post their results for people to watch. So I manually entered data from a variety of videos into a spreadsheet. There was speculation that Blizzard changed the card drop rates since the game officially launched in March, so I only used videos that were posted within the past two months (91% from the past month). So every pack you open has a 99.81% chance of containing at least one common card. Now we're on the right track! If you go down from there, you'll see that the chances of getting at least one legendary card in a pack are actually considerably better than the .5% that we got from our 40 pack experiment. Now, while we did expand the sample size, we didn't observe all the possible combinations of cards. In 1,000 packs, we saw 16 of 55 possible combinations. The most common pack after a '4100' (4 common, 1 rare; 61% of packs) was a '3200' (3 common, 2 rare; 12.20%). UPDATE: Since Blizzard has released new DLC, we don't know if these numbers are still accurate. Thanks to everyone who sent in packs! If you can't do that, post a screenshot of your best or worst pack in the comments! Special thanks to @indiemaiden for crunching all the numbers, and Kotaku's Chris Person for the image. If you're interested in the videos where the data came from: 40 packs, 40, 15, 80, 40, 15, 40, 600, 90.